This post is as much for my own future reference as anything. A few weeks back, I made a batch of spätzle to serve with jägerschnitzel and sauteed green cabbage. I’ve made spätzle before, using the slice-off-the-cutting-board method, which is very slow-going, tedious, and practically cooks my fingers in steam by the time it’s ready. Tastes great, but not worth the aggravation. When Jeremy got me a potato ricer a month or two back, I immediately started scheming to adapt a spätzle recipe to use with it. This recipe did just that, and it has already made this ricer not just a useful kitchen implement for me, but an essential one. Spätzle is the best! My only problem the first time around was when the plunger (sticky with batter) grabbed the hole screen and pulled it up without my noticing; when I went to refill the ricer, the batter just fell straight through in a big inedible blob. This time I just loaded all of the batter up at once in a larger pot of water. I made my spätzle a bit before the rest of the meal was ready, so they sat in the colander and waited until the last few minutes, when I sautéed them with a bit of butter to reheat and flavor them. Absolutely wonderful, and very authentic looking and tasting. 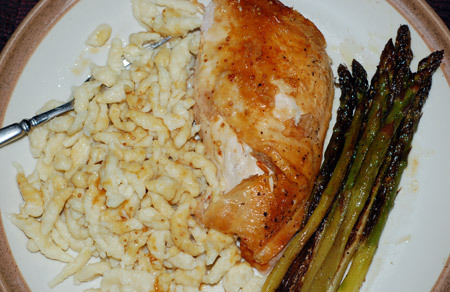 Last night’s spätzle went with a roasted chicken and some asparagus, and we’ll definitely be eating more of it in the future. This batter worked perfectly in the ricer, though you may have to adjust the amount of water and flour in the batter to give it more or less body, depending on the humidity. It seemed to work best when still loose but with the gluten developed enough that the remaining batter on the spoon elastically sprang back up after a blob dripped off. See the photo here for reference. Bring 2 quarts of lightly salted water to a boil in a large saucepan over high heat. Scrape some of the dough into a potato ricer with large holes and gently press the dough into the boiling water. Don’t crowd the pot too much, and make sure the plunger of the ricer doesn’t grab the screen and pull it up. 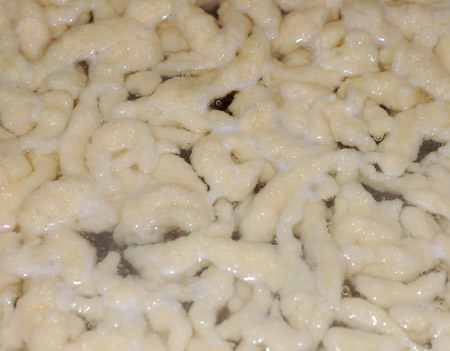 Cook until the spätzle are tender but still firm, stirring occasionally, about 3 to 4 minutes. They will rise to the surface when done. Lift the cooked spätzle out of the water with a large slotted spoon, and shake off the excess water. (You can also drain the spätzle in a colander.) Serve immediately, or make in advance and sauté in butter to reheat before serving. If doing the latter, it may be preferable to cool them in an ice bath and toss with some oil before sealing so they don’t dry out. To reheat, either shock them in boiling water or sauté them in butter until golden brown. Update 7/7/08: Every time I made this, I like it more. It’s about the easiest possible homemade noodle. The batter comes together in moments and doesn’t need to be attended while it beats, so I can boil the water and prep the rest of dinner in the meantime; I load the batter into the ricer and gravity drips it down into the boiling water; and when it’s cooked, I can leave it in the colander until the rest of the food is nearly done and saute it quickly in butter to reheat it. Update 2/10/09: I made brats and apples with spätzle for dinner last night. 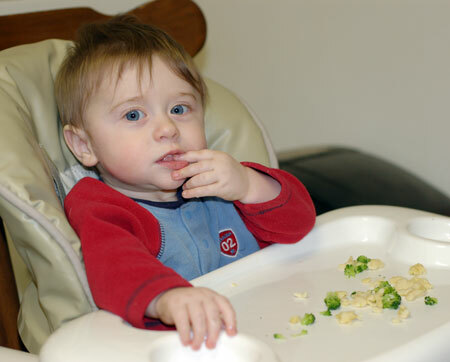 Nolan had tastes of everything, and we determined that spätzle is an ideal finger food for babies. Here he is feeding himself spätzle that I mixed with some broken-up broccoli florets (frozen ones, just microwave covered for a few seconds to thaw and steam) and tossed with a little parmesan. Update 8/23/11: Made x1.5 batch of spätzle with shredded zucchini and enzyme-innoculated all-purpose flour (10% sprouted flour) to go with rhubarb pot roast. Essentially I threw the flour in with the eggs and about 3/4 C of shredded zucchini, then drizzled water into the thick batter until it reached the right consistency. The zucchini didn’t clog the ricer, as I had worried, and it didn’t negatively impact the final texture of the spätzle; I sauteed it with butter, red onion, garlic, and chunks of zucchini, and Nolan ate a lot of it for his dinner after I shoved the first piece in his mouth.